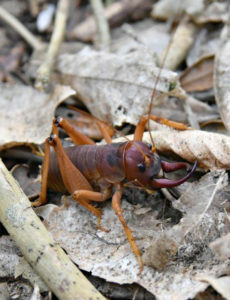 The Mercury Islands tusked wētā is an insect the size of a mouse. Its long curving tusks are weapons that males use to joust and grapple with each other in ritualised combat over mates. This bizarre species was discovered in 1970, living on one small island off the Coromandel Peninsula in northern New Zealand. It very nearly went extinct, saved in the nick of time by heroic conservation work, yet hardly any New Zealanders have even heard of it. Middle Island is tiny, only 15 hectares, but in 1970 had the distinction of being the only one of the Mercury Islands with no introduced mammalian predators; in particular, the Polynesian rat or kiore. In the decades after tusked wētā were discovered on Middle Island there seemed to be plenty of them living there – you could see dozens in a single night. Then in the 1990s the population plummeted to less than 200, possibly because of a severe drought. Fewer and fewer were recorded each year. The last time a tusked wētā was spotted on Middle Island was in 2001: eight subsequent searches between 2009 and 2012 turned up nothing. Just 31 years from discovery to demise. But not quite. In the 1990s the NZ Department of Conservation ruled out relocating any tusked wētā to other islands, worried about the effect of taking even a few from the tiny population still surviving. Instead, they captured two females and a male and tried to breed them in captivity – without success. They tried again with three more wētā in 1998, but this time everything went right: the insects bred prolifically, producing 181 hatchlings. In 2001, just as the species was going extinct on Middle Island, DOC released young wētā on two other islands in the Mercury group they’d newly cleared of mammals through poisoning and trapping. Since that release, hundreds more wētā have been bred and released onto four other pest-free islands, and all seem to be doing well. Every Mercury Islands tusked wētā in the world is descended from those three individuals captured in 1998, in a last-ditch, and fortunately successful, attempt at captive breeding. This is a particularly New Zealand story: a species gets down to a handful of individuals and is heroically pulled back from the brink. It’s almost our trademark: we don’t get out of bed until the species is down to double figures. But when we do heroic conservation feats with birds, like the kākāpō and black robin, sponsors line up to be associated with the rescue, and TV crews fly in from all over the world to make inspiring documentaries. 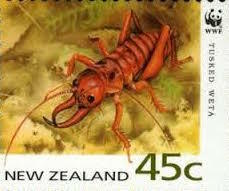 Even though the Mercury Islands tusked wētā story is just as inspiring, even though DOC’s earnest publicity drive in the ’90s managed to get it onto a postage stamp, it isn’t a household name. That’s a shame, because the wētā story is much more representative of what we’ll need to do to save New Zealand’s biodiversity. Most of our endangered species are not birds. They are fungi, lichens, insects, worms, shrubs, and snails: things TV crews overlook. They don’t require heroic multi-million-dollar conservation battles. Rescuing the tusked wētā cost a few thousand dollars a year; they were reared in recycled ice cream containers. Many of our critically-endangered species could be saved by similarly small projects: potting up cuttings in a back yard, fencing a patch of forest to keep cows out, trapping all the predators on a tiny island. With its budget being reduced almost every year, DOC simply doesn’t have the personnel or funding anymore to rescue everything, and increasingly depends on the public’s help. The small-scale projects that could save obscure endangered species would be perfect for these sorts of partnerships. But instead, the public conversation about conservation seems obsessed with saving cuddly celebrity animals, ones people would perhaps secretly like as pets. It’s as if we don’t trust New Zealanders with the facts. Slugs and spiders are just as endangered, and count just as much, as penguins and dolphins. If we’re tallying biodiversity, a species is a species. Last year I wrote about how we can prioritise species conservation to get the biggest bang for the buck, and Jesse Mulligan interviewed me about it on the radio. Jesse got quite impassioned about the neglect of uncharismatic species, and started a Critter of the Week slot with DOC’s Nicola Toki to highlight the plight of the rare and overlooked; these days I help by beefing up the corresponding species’ Wikipedia page each week. Perhaps by telling these stories we can help people care about all New Zealand’s threatened flora and fauna. Even the prickliest wētā. This entry was posted in Field Notes on 31 May 2016 by Mike.